Join the discussion on our forums! Come discuss Spellzerker over in our dedicated Spellzerker discussion topic. At first I thought this card was probably pretty bad, because most classes that want spell damage already have class cards that grant them access to it. 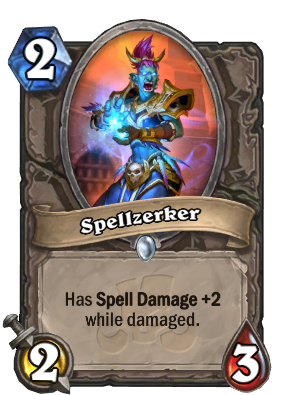 However, +2 spell damage on such a cheap minion is pretty tempting, especially when you combine Spellzerker with cards like Defile, you quickly see how much of a help this card can be. In the defile case, you will deal 1 damage, then 3 damage, and then 1 damage again - granting a pretty similar effect to a card like Tainted Zealot which did see play at one time in standard (although doesn't anymore). I don't think the card will end up seeing a lot of play, but I wouldn't be surprised to see it experimented with in the first few weeks - it's got some potential to explore, especially with other classes like Druid, Hunter (Grievous Bite looks good), Paladin, Priest, Rogue and Shaman. Triggering the damaged effect though is tricky, and that's ultimately why I think the card will end up not seeing much play outside of maybe Warlock, which has many ways to trigger it's effect. Well if this sticks on the board for 1 turn you can clear a buffed paladin board for 4 mana instead of 6 with warpath and it has a lot of other synergies I'm sure this will be played quite a bit. Works roughly the same as Tainted Zealot when used with Defile (1-3-1-1 rather than 2-2-1-1), but with a generally better body. 2 Mana 2 Spell dmg with 1 more card to be activated is potentially nuts. the highest of feelings in terms of spell dmg/cost ratio is Maly with 0,55, followed by Evolved Kobold with 0,5. However in practical use Kobolds cheaper cost made it a lot better to use than Maly in a lot of my spell dmg decks in the past. This card here doubles those other 2 cards ratio. I foresee an effective niche deck abusing this within the next few sets. You will see a ton of this card in Arena, but nothing beyond it. Funny one. BTW they removed Enrage keyword why exactly? It's just easy to write 'while damaged'. There's no need for a keyword.